DeCordova New England Biennial 2019 presents a survey of contemporary art of New England, showcasing compelling and ambitious art-making in the region. The twenty-three artists selected for the Biennial are from all six northeastern states—Connecticut, Maine, Massachusetts, New Hampshire, Rhode Island, and Vermont. Featuring work across diverse mediums including painting, video, sculpture, photography, fiber art and ceramics, the Biennial will occupy all galleries of the Museum and extend into the Sculpture Park with new site-specific commissions. Support for this exhibition and publication was generously provided by anonymous donors, The Artist's Resource Trust Fund of the Berkshire Taconic Community Foundation, The Meredyth Hyatt Moses Fund, and the Nathaniel Saltonstall Arts Fund. Collaborate with deCordova New England Biennial 2019 artist Chanel Thervil to represent your super power though vibrant color and bold, abstract shapes. Add your unique element to a massive community installation punctuating deCordova’s landscape. Rain or shine. For adults and families alike! FREE with admission or membership. Children under 12 are always free! The Isabella Stewart Gardner Museum's Third Thursday: S.O.U.L.S. Join artist Chanel Thervil for artmaking that honors a moment of triumph in the art studio as a part of The Isabella Stewart Gardner Museum's Third Thursday: S.O.U.L.S. ( Sharing Our Unique Life Stories). Join us for The ARTery 25, a celebration of millennials of color in the Boston arts and culture scene. The event will be the culmination of a weeklong online and on-air editorial series that highlights the stories of 25 artists, programmers, curators and arts administrators shaping the creative and cultural landscape in Boston. Meet and mingle with the honorees over dinner and cocktails, enjoy live musical performances from Billy Dean Thomas and Anjimile and get down to the tunes of DJ Rilla Force. This event is free and and open to the public, but advance registration is requested. Walk-ups may not be guaranteed entry. Come celebrate spring 2019 Artist in Residence Chanel Thervil's mixed media installation ENIGMA: Reactions to Racism. The artist will give us a walk-through, and refreshments will be served! The exhibtion will be on view at Urbano from Feb 5th-May 2nd 2019. What makes a face unique? Artist Chanel Thervil makes portraits that use many patterns, textures, and materials on wood that highlight special qualities about each person. Visitors can make mixed media portraits inspired by her work. This event aims to gather all generations of people through engagement with an interactive artwork and storytelling about Afro-Latin cultures. Come make something creative to add your voice to the artwork, enjoy free mangos and join the discussion with Haitian and Dominican artists Chanel Thervil and Iris Lapaix! Viva el Latin Quarter is Hyde Square Task Force’s annual series of free community events. Our events aim to celebrate and uplift Afro-Latin arts and culture and provide opportunities for neighbors to connect all while bringing vibrancy to Boston’s Latin Quarter. Signature Viva el Latin Quarter events include a summer series in July and August, a series of events during Latino Heritage Month, a Halloween Festival including a youth-produced haunted house, and a Three Kings Day Parranda. Women’s Equality Day marks the passage of the 19th Amendment which granted many women the right to vote. Though this date honors a momentous occasion in United States history, it still took nearly five more decades for all women to have the right to vote. The changes suffragettes inspired were due, in part, to their brave protests—protests many called riots. Those “riots” were truly a revolution, one that continues today. 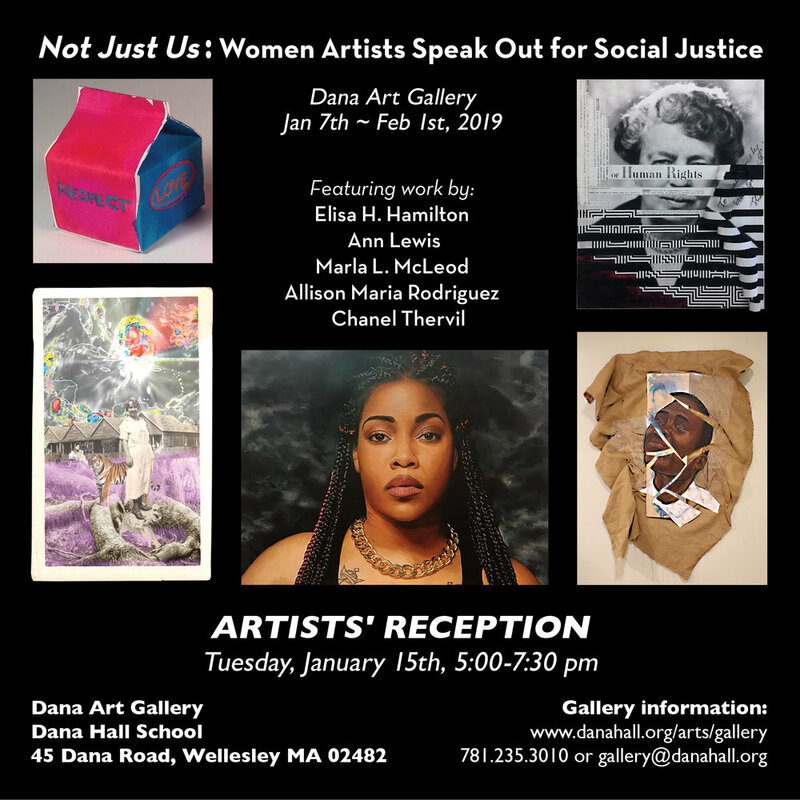 In honor of all those women who continue to protest on behalf of women’s rights and against inequality, Arnold’s Good Gallery introduces More Than a Riot, a temporary art exhibition in Downtown Crossing. More Than a Riot showcases the work of female and female-identifying artists across all media who are creating art in conversation with the current cultural climate, specifically issues of inequality and feminism. The exhibition highlights contemporary voices confronting bias, injustice, and hate who, through their work, refuse to be silenced. While we have a long way to go in the United States, the work of these artists proves it’s always been more than a riot, it’s a revolution. Arnold Worldwide's Good Gallery is an art space that showcases artists working in a variety of mediums and is a place to highlight events and movement beyond 10 Summer Street. The space has been featuring photography, ceramics, and illustrations since 2017. On the evening of June 20, join the Museum of Fine Arts, Boston for Juneteenth—the oldest nationally celebrated commemoration of the ending of slavery in the United States. In partnership with the Transformative Culture Project, the night includes thoughtful discussion, powerful art and engaging activities featuring artists from Boston's local creative community. • Catch a screening of Marvel's "Black Panther" on the Huntington Avenue lawn beginning at 8:30 pm with lawn games and live entertainment preceding the screening—including DJ TROY Frost and an artist-led workshop with Chanel Thervil. "Black Panther" kicks off this year's Roxbury International Film Festival—the largest New England film festival dedicated to celebrating films by, for, and about people of color—and the MFA's Sunset Cinema film series. • Visit the galleries on a tour highlighting African American artists, whose works are on view in the Museum, and hear from Chanel Thervil during her Artist Talk at 5:30 pm as she discusses representations of blackness, the relationships between figures and abstractions, and the techniques used in her work. The poetry reading will take place on Thursday, June 14, 2018 from 6 - 7:30 p.m. The exhibition will run from June 15 - August 15 at the Mattapan Branch of the Boston Public Library. In conversation with the themes in the A.R.T.’s world premiere production of Jagged Little Pill, “The Family Room” is an art showcase created to highlight stories and experiences of belonging and family with an emphasis on QTPOC and WOC perspectives. “Family” comes in different forms and we go about creating biological and chosen family in a variety of ways. Belonging to a group or family informs our own identity. “The Family Room” creates the space to explore the things we inherit from family—the good or the bad and anything in between. We invite artists from our communities to peel off the masks and get real, uplifting the importance of vulnerability amongst our family. We look forward to sharing our 2018 National Prize Show with you from May 17 through June 23 in both our Kathryn Schultz Gallery and our University Place Gallery. We hope that you join us for the Public Opening Reception of the 2018 National Prize Show on Wednesday, May 16 from 6 - 8pm. The May 7th evening will focus on exploring on the value of small arts magazines in the Boston area. It will also examine ways in which they can be supported at a challenging time for independent arts journalism. RadicalBlackGirl presents Black Woman Is God, an event celebrating the wonders of Black Womanhood. The City Talks: Martin Luther King, Jr.
Join Boston-area thinkers, institutions, entrepreneurs, activists, city officials, and artists for a discussion to commemorate the Civil Rights Movement and the 50th anniversary of the assassination of Martin Luther King, Jr. This discussion aligns with themes found in “Monuments to Us,” on view now. America has a long, complicated history when it comes to accepting or embracing blackness. Similarly, millennials are often the scapegoats for the death of beloved resources, industries,and social structures older Americans have held dear. What does it mean to sustain an art practice when both attributes are a part of your identity? This panel offers the voices of four American millennial artists working in performance, traditional, and digital media to discuss how the intersections of their identity shapes their practice, perceptions of blackness, and potential supports for forthcoming generations. Lesley University's College of Art and Design presents #SayHerName: Watch Us Werk in the VanDernoot Gallery from March 13 to April 21. The Brookline Arts Center is pleased to present Red, White + Blue. Looking for work that explores the complexity of “Red, White + Blue”. From the charming to the challenging, selected work expresses nostalgia, national identity, political commentary and diverse interpretations of pride. Please join The Albright-Knox Art Gallery for the first of two Radical Women’s Nights Out to celebrate We Wanted a Revolution: Black Radical Women, 1965–85. Explore the timely themes of this exhibition more deeply through a conversation about the powerful role art can play in creating change with artist Julia Bottoms, writer and disability activist Keah Brown, and artist and educator Chanel Thervil, moderated by Albright-Knox Chief Curator Dr. Cathleen Chaffee.